Hello and welcome to the home page of Parker Friedrich Marketing and Consulting, established in 2006. Now let me tell you a little about myself and my Angus background for those who are unfamiliar to me. I was born in Gainesville, Texas, in 1969 on a registered Holstein dairy farm. I remained there dairying, farming, and working with my father’s artificial insemination business until I graduated in 1993 from Texas A&M at Commerce. I then went to work for Select Sires in Stephenville, Texas, as a DSM. That is where I started A Plus Angus as a managing partner in 1995. The herd progressively grew over the years and was built around foundation females that we owned such as GAR Scotch Cap 867, Thomas Lucy 9083, GAR EXT 4406, GAR New Trend 780, GAR Bando 530, and Thomas Lucy 1041. The herd was marketed annually and became very progressive with ET production. The 867 cow allowed us to make trades with prominent breeders to obtain daughters and granddaughters of Forever Lady 57D, Primrose 2424, Everelda Entense 1905, and Everelda Entense 1137. The herd was very self sufficient and maintained a profit for the last five years of its existence. In 2004 I decided that I was intrigued by the marketing aspect of the Angus breed and told Brad Allen, owner of A Plus Angus, that I would like to pursue that venture. We both decided it would be best to sell the herd. In March of 2006 we had our final sale. The dispersal sale totaled $1,455,679 on 122 lots for an $11,932 average which surpassed all previous Angus sale records for the state of Texas. 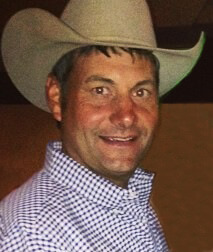 I am currently employed by American Breeders Service as a Beef Sire Acquisition Specialist as well as owner of Parker Friedrich Marketing and Consulting. I call home Stephenville, Texas were I reside with my wife Cindy Friedrich who is a realtor for Coldwell Banker and my three children; Dally, who is 21 who just graduated and is running a Boutique she owns, Sterling, who is 18 and loves basketball and showing cattle and baby Brax who was born September 8, 2011 and I’m told by my mom is the one that will make me pay for my raising. In November of 2017 I hired Matt White to assist me with sales I manage and to help at the number of sales that I have consulted on. Matt grew up in Alvarado, Texas showing heifers. He has worked at or has managed at such Angus operations as Harper Land & Cattle, Akers, Buford’s and Evans as well as M6 Charolais Farm. He will assist me at sales as well as head up catalog production for sales I manage. We would certainly love to help you purchase cattle or sell them and we will give you a very honest opinion on the cattle we sell or purchase for you. If I can ever be of assistance please don’t hesitate to call.